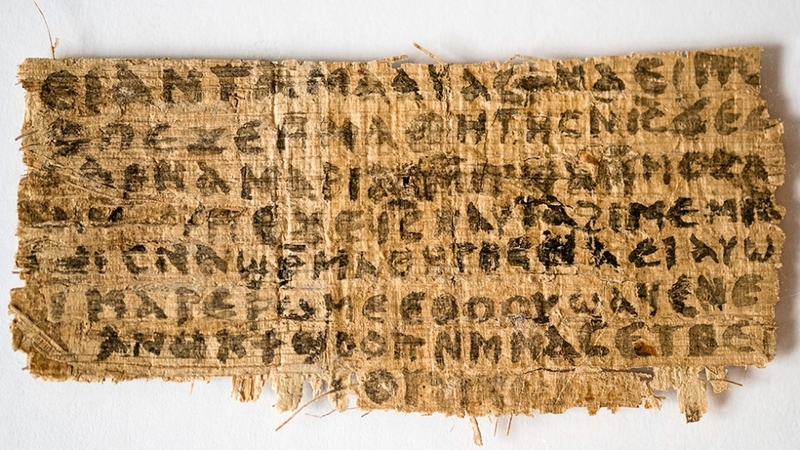 In 2012, Harvard professor Karen L. King announced the existence of a Coptic papyrus in which Jesus mentions his wife. She described the text as a fragment from a lost Christian gospel dating to the second century. A media frenzy ensued, and photographs of the fragment were made available for study. Although the actual papyrus on which the text is written has been shown to be ancient, the text itself is believed to be a modern forgery. The “Jesus’ wife” papyrus. Photo: Harvard Divinity School. Jennet wondered what would happen when she visited Sebelius this time. She was dressed demurely, she thought, in a Black Watch plaid skirt that fell to just above the knee, flats, a white blouse with green piping, and a matching cardigan. Kyle said it looked too much like a Catholic schoolgirl outfit, but she’d always liked it. Would there be another kiss? I want him to touch me again. Or would he, as she expected, pretend it had never happened? She hadn’t caught even a glimpse of him at the Wellness Center since Monday; he must have been avoiding her. But even her feelings about the kiss couldn’t eclipse her excitement about the news she had to tell. When he opened the door, the first thing she noticed was that he was wearing the same shirt as last week, a flowing linen one with long cuffs. Her eyes were level with his chest, and she saw the open collar of his shirt with its V-slit, and the ring-shaped gold pendant he always wore. Then she looked up at him and her eager smile faded at the rather grim look on his face. He seemed to remember himself and stood back, beckoning her to the cool, dark interior of the house with its heavy furniture and rich, patterned rugs. They sat at the dining room table, and she began to explain about the text in the papyrus. It was the last several lines of a lost Pauline letter, she was certain of it. “Oh yes, I can prepare a perfectly sound edition of it, from a linguistic standpoint. That’s not a concern. But even if the journal I pick is under the radar, it’s still going to hit the news sooner or later. There will be international headlines. People camping on your doorstep trying to get interviews. And people with a vested interest in proving this is a forgery will accuse you of chicanery. If you hand this over to the big guns, at least they’ll take most of the flak instead of you.” She paused, remembering the media frenzy over the Coptic “Jesus’ wife” papyrus that had surfaced recently to much fanfare, only to be attacked as a fake by numerous scholars. “I’m sure he was shocked when he saw what it said about Didyme. It must have rocked his world!” she laughed. He chuckled too, and then his face grew serious. “I don’t want some bigshot from Harvard to take this over. I want you.” Suddenly, he looked confused, as though he’d meant to say “I want it to be you,” but the words hadn’t come out right. Notes: The ancient church at Laodicea (in modern-day Turkey) was one of the Seven Churches of Asia mentioned in the book of Revelation. The Christians at Laodicea may have been the recipients of a letter from Paul (or at any rate, the author of Colossians) which is now lost. Like so much else about the New Testament, the nature and even the existence of this letter is much debated. Over the centuries, quite a few fake “Letters to the Laodiceans” have surfaced, so any new claimant would be scrutinized very minutely. 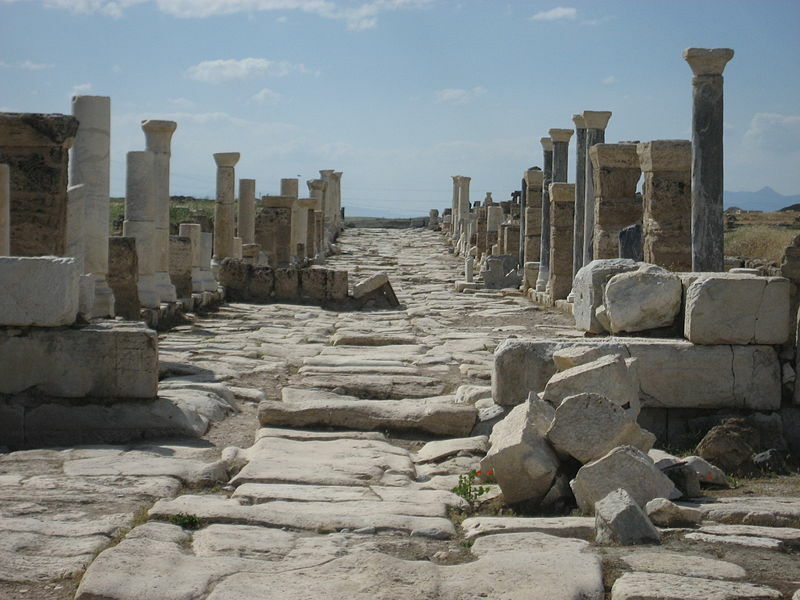 A street in Roman Laodicea. Source: Wikipedia. Hello LM. I am finding the papyrus storyline fascinating. The fact that Jennet got to cop a gander at eye level of his manly chest, is also quite a lovely thought. LOL. Well, he is unique among my characters, in fact the only one who has not even a smidgen of Mr. H. in him. Different DNA entirely 🙂 But based on a real person. Yep, it’s true! Sibelius is based on one of my old profs from graduate school. He started out as a minor character in my “Laura and James” trilogy, and then I decided to give him his own story. I’m glad! Yes, I like to inject that bit of feminism. I got the idea from a real papyrus I read, with a woman named Didyme in it. Sadly, she could not read or write, so her husband had to sign for her. This is my little bit of revenge for Didyme! !